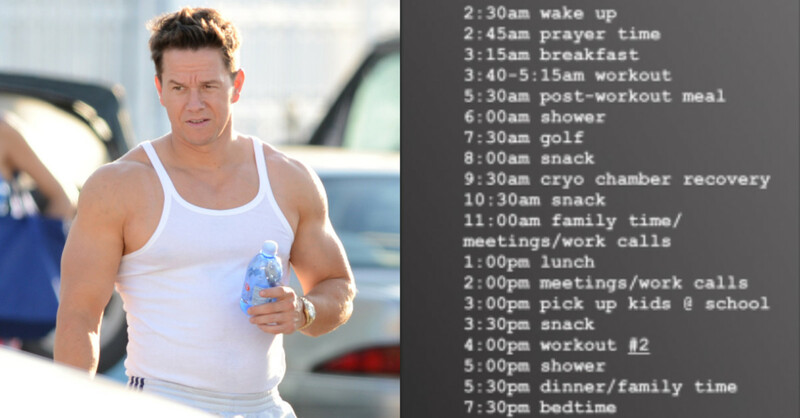 Mark Wahlberg’s Daily Schedule Is Kind of Insane. Celebrities often try hard to seem relatable, and perhaps that’s what Mark Wahlberg was doing when he posted his daily schedule to Instagram Stories recently, apparently at the request of a follower. A look into the life of an incredibly wealthy, very in shape actor! Who goes to bed at 7:30pm! Wahlberg’s Instagram is mostly videos and photos of him working out, so that part checks out. But civilians had some questions about how Wahlberg manages the rest of his time. Wahlberg posted a video Wednesday morning, at 3:48am ET, from Equinox to show how dedicated he is to his routine. But c’mon, show us prayer time, or cryo time. Preferably at the same time.